The Minions have taken over. The doofy little yellow characters from the “Despicable Me” franchise of kids’ films have become extremely popular in Japan, grabbing space from the nation’s own array of cute characters. Maybe your students have talked about them, or your own kids mention them, or you’ve gone outside of your house in the past two years. People love ’em. 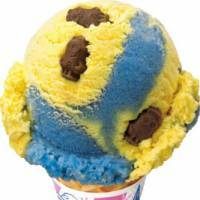 Now, Baskin Robbins is cashing in on the Minions’ success with a series of items themed after the overall-sporting twerps. The highlight doubles as the ice cream chain’s “flavor of the month,” the semi-awkwardly named “Booya! 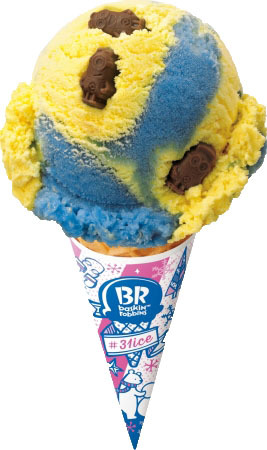 Minion.” This offering (¥360 for a single scoop) mixes banana (the critters’ favorite fruit) with pineapple and soda, with chocolate pieces shaped like the characters embedded within. Banana-flavored anything is always a risk, as few artificial takes on a fruit miss the mark so often. Yet this ice cream handles it well, mainly by making that flavor the most subtle of the three main tastes. The pineapple and soda dominate, and this combo makes for a nice tart experience. The chocolate, meanwhile, offers a nice rush of sweetness when it pops up. Whether you like these corn-pellet-looking characters or just want some sweets, this sweet delivers.